An Egyptian court has sentenced 75 people to death for their involvement in a 2013 sit-in protest by Islamists that was broken up by security forces in an operation that left at least 600 people dead. 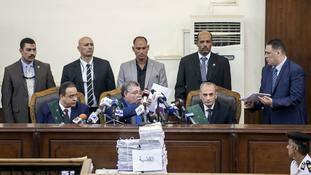 Those convicted, in a case involving 739 defendants, included senior leaders of the outlawed Muslim Brotherhood. The defendants faced charges ranging from murder to damaging property. The court in Cairo also sentenced to life in prison the head of the Brotherhood, Mohammed Badie, and 46 others. Mahmoud Abu Zaid, a photojournalist known as Shawkan, whose detention has been criticised by rights groups at home and abroad, received five years in prison. He was detained in August 2013, meaning he should walk free within days for time served. The 2013 sit-in at a square in a Cairo suburb was staged by supporters of Mohammed Morsi, a Brotherhood stalwart. He became Egypt’s first freely elected president in 2012 but was ousted a year later by the military, then led by President Abdel-Fattah el-Sissi, following days of street protests calling on him to step down. One of Mr Morsi’s sons, Osama, was among 22 defendants who received 10-year jail terms. The convictions can be subject to appeal.